I really enjoy the fullscreen versions from Vudu, but unfortunately Severed Dreams is the same widescreen version that's on the DVD. Babylon 5 is done in Surround Sound so that is possibly related. I don't have a good speaker setup to test this theory. The DVDs do seem awfully quiet to me as well. I don't think you actually know what evidence you are asking for. You've made a conclusion first and won't accept any answers that don't fit your preconception. With the high-pitched voice and all? That would have been awesome! Ha. Hm that's an interesting thought. The Drakh are a bit underdeveloped. Joe had a funny line in his script books saying he "created skeletor [from He-Man] as a species"
What does "supposed'" mean? Joe wrote this early in season one. Different strokes for different folks and all that I guess. But then I am known to like immature humor so this stuff makes me laugh. Some of us enjoy Joe's type of humor quite a bit. I think Claudia is very good at it too, Babylon 5 included (I think her scenes in Acts of Sacrifice are classic). I will find this when I get home tonight. The point was *NONE* of that was from the books! Don't think that ever happened. And I think Jan's point is that Joe's been publishing work that has nothing to do with B5 pretty much non-stop ever since the end of the show. They have these things called planes that don't require the ability to drive a car. They still do this in airports today if something looks off. Doubtful. WB has the rights. He can't pick where the show goes. He does the music on the reality game show, "The Amazing Race." I think it ended up giving Babylon 5 more of a sense of realism as it were; since characters actually change positions and come and go. That's very odd to pick as a first episode, considering all its tie-ins to earlier season one. Certainly wasn't my experience. But there are definitely better episodes in season one than "Midnight on the Firing Line." IIRC, the database got a little glitched awhile back, so that title came from a different thread. 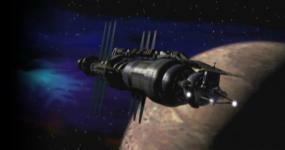 According to the outline, the Babylon 4 trip would have been the beginning of the sequel series, not the end of the Babylon 5 story. Sinclair was there to the end of the sequel as well. Looks very cool but I am guessing unlicensed? The only dolls that I recall were the ones done by "Exclusive Premiere" around the time of the 5th season. Those were only in 6" and 9" versions.